Thursday, March 23, 8 p.m. I've never bought into the idea that drugs or booze should be a requirement for enjoying a band. Such mind-altering approaches might be necessary enhancement for appreciating some acts (ahoy, jam-band fans!). They're also a solid excuse for appreciating others (howdy, EDM lovers!). But if you can't love an artist's music when you're sober, is it really love? Most of the time, I think not. That said, people can fall hard and fast for something exciting and new when inebriated. "Youthful indiscretions," as politicians like to call them, can result in a lingering lifelong passion for music you might not have connected with while sober. In the morning—or years, or decades—after, it reveals its true self. Sometimes it's truly incredible; sometimes utterly horrific. The Meat Puppets, though, are different. My obsession with the Arizona psychedelic alt-cowpunk trio led by brothers Curt (vocals, guitar) and Cris Kirkwood (bass) began when I was the most unrelentingly party-version of myself. A couple decades later, as a mostly sober aging hipster, I'm just as dedicated to the band. Their sprawling sound and stylistic experiments are as thrilling to me today as when I first spaced out to "Up on the Sun" (Up on the Sun, 1985), slack-jawed at its hooks and epic mid-song tempo shift. This was in the early '90s, so the band had already been around for nearly a decade. And, after seven albums, they were in the midst of shifting from L.A.'s legendary punk label SST to a major-label deal with London Records. Up on the Sun, actually, wasn't my first Meat Puppets disc. I picked up a copy of No Strings Attached, a 1990 compilation of their non-hit deep cuts for SST, and listened to it non-stop. The chronologically sequenced album starts with minute-long, trainwreck punk tunes. A few tracks in, the songs stretch into five-minute guitar epics that touch on ZZ Top-style classic-rock and Rush-y prog-rock, sandwiching a thick slab of psychedelic pop. I couldn't believe it was the same band. I could have heard them sooner. I'd been listening to the band's SST peers religiously: Minutemen, Hüsker Dü, Black Flag. But for some reason, the Meat Puppets didn't make the rotation until years after I encountered those bands. It was probably for the best; I wasn't ready. My sonic palate needed some expanding in order to appreciate a band that can warble through the Sons of the Pioneers' "Tumbling Tumbleweeds" one minute, then drive home intricate instrumentals or hyper-speed punk songs (like their live staple, "Sam") the next. It was also probably the best time to become a Meat Puppets fan. They had a beefy back catalog to catch up on—including '80s classics like Meat Puppets II and Up on the Sun. Due to their new major label-dom, they were doing weird things like appearing as the hired entertainment at a rich-kid rager in the 1990 Beverly Hills 90210 pilot. A couple years later, during the taping of their 1993 MTV Unplugged special, Nirvana famously invited the Kirkwood brothers on stage to perform three Meat Puppets tunes: "Plateau," "Oh Me" and "Lake of Fire." The next year, the Meat Puppets had their only radio and MTV hit with "Backwater" (Too High to Die, 1994). Success nearly killed the band. If they'd been any more popular, they would have been the subject of a great Behind the Music episode. In the mid-'90s, Cris Kirkwood fell into serious drug addiction, was shot by a security guard in a post office scuffle and wound up in an Arizona prison. Original drummer Derrick Bostrom left the music biz. Curt Kirkwood spent several years doing solo projects and putting together new bands like Eyes Adrift with Nirvana bassist Krist Novoselic and Sublime drummer Bud Gaugh, and a version of the Meat Puppets that didn't stick (save for drummer Shandon Sahm, who's played with the brothers for 11 years now). A funny thing happened on the way to obsolescence, though. 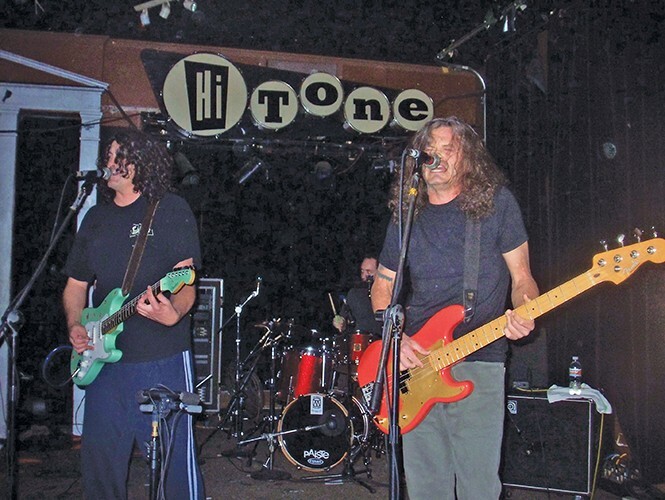 The Meat Puppets found new life when Cris rejoined the band a decade ago. They signed with Megaforce label, releasing a surprisingly strong series of albums like Sewn Together (2009), Lollipop (2011) and Rat Farm (2013) that easily hold their own against the band's SST output. Their instrumental prowess has only broadened with age, along with the brothers' formerly wiry physiques and their touring lineup: Curt's son Elmo has played guitar with the band since 2011. And new life in the band meant new life for my fandom, too. No shots or bongs required.